The actual price is a limited quantity offer ! 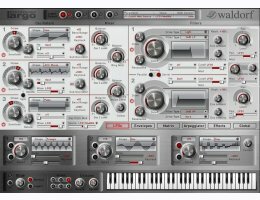 Many producers and synthesizer enthusiasts asked for a full-blown Waldorf Synthesizer for their virtual rack. We listened, and now we proudly present Largo. Largo is the first pure software synthesizer with Waldorf DNA. And again – it is the cutting edge sound that makes the big difference. No wonder, as Largo mirrors the technology used in Blofeld and Q hardware synthesizers. As for every Waldorf instrument, ergonomics are a core feature on screen as well. Your eyes will be pleased with a clearly structured, graphical user interface that supports your workflow intuitively. Largo offers three fat oscillators, two of them with sub oscillators. These oscillators include models of classic analog waveforms as well as a selection of waves from the PPG and Waldorf Wave stored in two Wavetables. All these run through two Waldorf multimode filters with steep cutoff, resonance up to self-oscillation and a drive stage to add even more punch and grainyness to the sound. Ultra-fast envelope generators and flexible LFOs as well as an easy to understand, yet extremely versatile modulation matrix make for a sound designer's dream. The filters have always been a core part of any Waldorf instrument. With outstanding expertise in both analog and digital synthesis, our developers took utmost care in developing the filters. And you can hear a significant difference when working with a Waldorf filter - they just sound right! Use the comb filters for plucked, stringed or blown sounds. Band pass, high pass, low pass and notch filters are all available with 12 dB and 24 dB slope. All of them sound extremely accurate and add pure sonic quality to the sound of your music. Largo contains a flexible arpeggiator with 16 freely programmable steps as known from the exclusive Q synthesizer line plus an array of high quality effects such as Chorus, Flanger, Phaser, Overdrive, Delay and Reverb. The clearly arranged user interface helps you to create your own powerful synthesizer sounds in a breeze. Oscillators and filters are always in direct access while the submodules are only a mouse click away. It has the same exclusive voice architecture as the Q and Blofeld synthesizer line, fully integrated into the total recall system of your Digital Audio Workstation. Largo is copy-protected by the Soft eLicenser copy protection system. You do not need a USB dongle to use it. However, we strongly recommend to transfer the Largo license onto such a USB dongle (i.e. by Steinberg), since the license can become invalid in case of a hard disk crash or reinstallation of the operating system.